This is one of a handful of articles written for a local magazine DE1 while I was at University. My taxi driver (when I found one) thought I was mad. “I need a cheep hotel please, oh, and a cash machine.” I said. It must have been a curious sight to watch an Englishman walking alone across the square in front of Sarajevo’s deserted train station just as the shadows of the mountains had covered the tallest buildings on an August evening. “About 30?” I had absolutely no idea of the currency. He looked concerned and glanced at the other men standing round cars for confirmation. He told me he might be able to find something for about 40, and I gave him my “I ain’t nobody’s fool” look, and said 40 was my absolute maximum. So I got this guided tour of Sarajevo by night from a confused taxi driver unsure whether to laugh at my stupidity or be afraid of it. He told me I should be careful here, crime is high; people are poor. And I pretended not to be scared as we drove though a forest of mortared buildings, following bullet ridden road signs into a soviet-style high-rise ghetto. I bargained the woman on reception down to 45 for her last twin room. I definitely wasn’t going to pay more than 45. After showering I went back to reception to try and pick up a few tips on where to eat and get a beer. “But isn’t it dangerous?” If I’d impressed my taxi driver with my foolhardy courage, I certainly wasn’t impressing the receptionist. “No,” She said and pointed me towards the door and the shadows of the unlit market opposite. I crossed the market and found the trams and followed a hoard of young people into the city centre. I recognised a street from my taxi tour and wandered down looking at menus in an exotic tongue – what language do they speak here? I chose a pleasant looking Italian terrace as I knew the names of the dishes. I’d had quite enough adventure for one day. Tomorrow I’d explore. I ate a great meal, drank beer and watched the world go by. It just seemed like a normal city on a busy night. Sarajevo by day is more shocking. First you see the mortar holes, then a tower block with one side razed to the ground, the other side inhabited. Or a tall building with the bottom ten floors burned out and the top seven inhabited. I walked out of the centre, up the base of a mountain drawn by the view of tiny white pillars of a cemetery (the smallest of the city’s sizable collection). And then I stood dumbfounded and gazed at the hundreds of graves, all Islamic, all marked with the same date – 1997. Up from the city came the song of a choir of muezzins as the mosques called Sarajevo’s faithful to prayer. I wondered which way was Mecca. On the other side of town two boys of five or six stood with plastic riffles gunning down the people at the bus stop across the road. I stared at their faces. No-one flinched, no-one said a word, and the bullets ricocheted round the street and bedded themselves in walls. 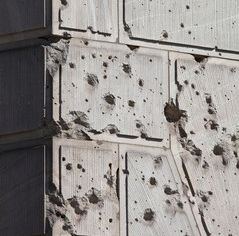 Suddenly I understood why every building in Sarajevo is scarred with a thousand tiny holes. Time for a beer. There is a thriving café life with enormous terraces packed with tables and Coca-Cola umbrellas. No one seemed to have good enough English to talk to me for more than a few seconds, or they just weren’t interested, until I met Darren, a financial journalist reporting on investment opportunities in Bosnia. He’d been here three weeks and I asked if I could tax him for some local information. Bosnia has three principal ethnic groups: the Bosniacs (predominantly Islamic), the Croats and the Serbs. The language is Bosnian (a Serbo-Croat dialect) and the currency is the Bosnian Mark (KM). There are three KM to the Pound making my hotel room about 15 quid and my beer a pound. Bargains. In 1992 Sarajevo was besieged by Serbian forces and 4000 shells a day were indiscriminately launched at the city destroying or damaging most of its buildings and killing over 10,000 people 1,600 of which were children. The three year siege was the longest in modern history. Apart form the redeveloped shopping area and a few key buildings the city is in much the same state as at the end of the war. Billions of dollars given to aid reconstruction have disappeared. Darren and a few colleagues that joined us later all complained that they hadn’t had a good meal since they’d arrived. I impressed them with my local knowledge and took them to a great Italian restaurant I knew just round the corner. In a pleasant bistro I found the next day I sat eating a Bosnian dish and staring at beautiful oil paintings. The artist was a man called Mustajbasic Mirsad. “He’s our friend,” the proprietor told me but wasn’t really interested in talking about it. I guess Bosnians have other things on their minds.